Make your stay extra special with our signature gift baskets, delivered to your unit and waiting for you upon arrival. Select from a variety of standard packages to enhance most occasions, or call us to have a custom creation made just for you! Orders must be made 7 days in advance. Arrive at your unit with and assortment of cool & delicious fresh fruits presented in a keepsake basket. Fruits may include apples, oranges, grapes, kiwi, pears, nectarines, bananas, pineapple, and coconut as available. 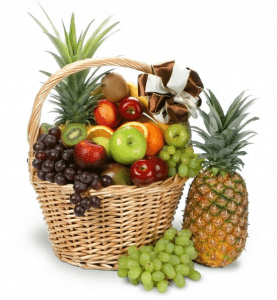 Exact basket and fruit selection may vary by season. A great gift for any occasion. 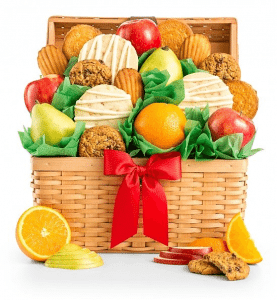 This wonderful gift basket combines a mix of premium fruits picked fresh from the orchard with fresh baked cookies in all-time favorite flavors. Presented in a charming French country basket, it's a festive gift that is the perfect start to your vacation! Every basket contains juicy pears, crisp apples, sweet oranges, oatmeal cranberry cookies, pineapple sugar cookies, soft madeleines and more. Be ready to hit the beach, with everything you need for a day in the sun! 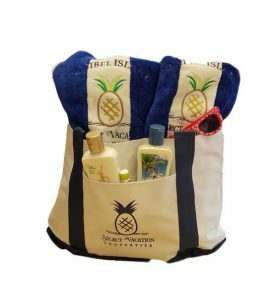 Comes with a keepsake Select Vacation Properties tote bag, two monogrammed SVP beach towels and an assortment of sun products. Celebrate any occasion with our selection of fine chocolates presented in a keepsake picnic basket. 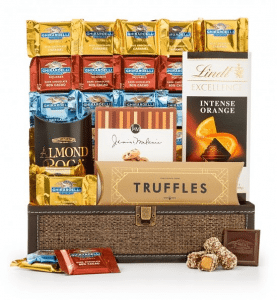 Indulge in an assortment of world famous chocolates and gourmet confections paired with sweet companions including Ghirardelli Squares in dark, caramel and sea salt chocolate, Lindt dark orange chocolate, cookies, truffles and more. 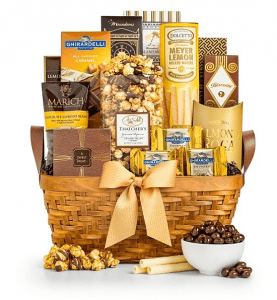 Start your vacation off right with this classic woven picnic-style wicker basket with handles, filled with gourmet delights including chocolate-drizzled caramel popcorn, lemon dolcetto wafers, Ghirardelli caramel milk chocolates, oatmeal tea cookies, almond roca, chocolate espresso beans and more.